A brace from Billy Bodin and Matty Taylor's strike saw high-flying Bristol Rovers overcome Cambridge. Bodin got his first goal with a low drive from 25 yards after nine minutes. Midfielder Bodin headed in his second from Daniel Leadbitter's near-post cross nine minutes later to take his tally to eight for the season. The visitors rarely threatened and Matty Taylor made it three by slotting past U's goalkeeper Will Norris to keep Rovers third in League Two. The result also dented Cambridge United's play-off hopes, as they drop down to 11th in the table. Match ends, Bristol Rovers 3, Cambridge United 0. Second Half ends, Bristol Rovers 3, Cambridge United 0. Attempt missed. Harrison Dunk (Cambridge United) right footed shot from the left side of the box is just a bit too high. Corner, Cambridge United. Conceded by Billy Bodin. Attempt blocked. James Dunne (Cambridge United) right footed shot from outside the box is blocked. Corner, Cambridge United. Conceded by Daniel Leadbitter. Foul by Daniel Leadbitter (Bristol Rovers). Delay in match Billy Bodin (Bristol Rovers) because of an injury. Corner, Cambridge United. Conceded by Lee Brown. Substitution, Bristol Rovers. Jermaine Easter replaces Rory Gaffney. Substitution, Bristol Rovers. Tom Parkes replaces Cristian Montaño. Goal! Bristol Rovers 3, Cambridge United 0. Matty Taylor (Bristol Rovers) left footed shot from the right side of the box to the bottom left corner. Assisted by Liam Lawrence. Substitution, Bristol Rovers. Liam Lawrence replaces Ollie Clarke because of an injury. Substitution, Cambridge United. Mark Roberts replaces Zeli Ismail. 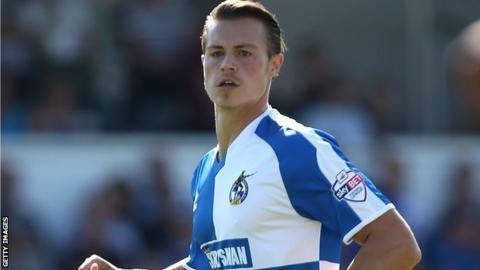 Delay in match Ollie Clarke (Bristol Rovers) because of an injury. Attempt saved. Robbie Simpson (Cambridge United) header from the right side of the six yard box is saved in the top centre of the goal. Corner, Cambridge United. Conceded by Steve Mildenhall. Attempt saved. Max Clark (Cambridge United) right footed shot from outside the box is saved in the top centre of the goal. Billy Bodin (Bristol Rovers) wins a free kick on the right wing. Foul by Ryan Haynes (Cambridge United). Corner, Bristol Rovers. Conceded by Will Norris. Attempt saved. Matty Taylor (Bristol Rovers) right footed shot from the right side of the box is saved in the top right corner. Corner, Bristol Rovers. Conceded by Josh Coulson. Attempt missed. Darnell Furlong (Cambridge United) right footed shot from the right side of the box is close, but misses to the left.